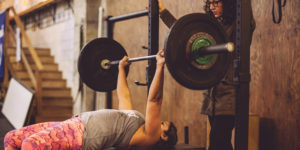 Whether you’re looking to lose weight, get stronger, get in better shape, learn new skills, or just have a blast with a fun group of people in a healthy environment, Foundation CrossFit is the place for you. 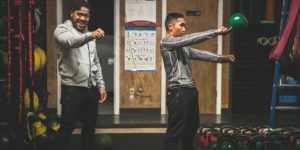 We offer three different entry programs: our group Foundations On-Ramp Program, One-On-One Private Training, and Experienced CrossFit Transfer. If you simply want to see what a CrossFit workout is and experience what makes Foundation CrossFit the leader in fitness education, join us for a free Community CrossFit class! Are you a non-CrossFitter who wants to come in and sweat? Join one of our Drop-In Fitness Classes! Completion of one of our on-ramp courses is required to be eligible for our monthly membership pricing. Once you are cleared to join our regular classes, our full schedule will be available to you. Our greatest strength is the knowledge we can share with you. Work closely with one of our coaches to focus on an exercise plan that fits your needs. We can offer training that is sport specific, or balanced based on your cardio, endurance, strength, and flexibility goals. Working with a personal trainer has many advantages. A one-on-one relationship ensures a program tailored to your goals, desires, and limitations. Our coaches will be aware of your level of fitness and limitations, scaling exercises to meet your ability and prevent overexertion and injury. In short, we can push you when you need it or slow you down to avoid overtraining. The Foundations Program is a 4-week, 12-class program which is dedicated to those who need an “on-ramp” to the “highway” that is CrossFit. At Foundation CrossFit we emphasize mechanics, consistency, and then intensity. We first focus on proper exercise mechanics and techniques at relatively light loads. You will become consistent with those mechanics under the watchful eye of our coaches. Finally, we will guide increases in intensity to drive adaptation. We offer the first week of the course for $100, allowing us to introduce our teaching methodologies. You may decide to continue for the full course, where we will provide technical instruction and increased complexity. The total cost of the 4-week, 12-class course is $275. Those with 6+ months of experience at a CrossFit affiliate are welcome to join via our transfer program. Our Transfer Week allows new athletes an opportunity to sample our classes, meet our coaches, and get to know our community! The Transfer Week includes 7 days of classes, where a Coach will evaluate your movements throughout each class. You must pass a Movement Checklist in order to be eligible for our monthly rates. Learn about healthier nutrition options as you work towards simplifying and cleaning up your nutrition. We can discuss such subtleties as timing, the removal or need for supplements, practical applications of dietary needs, preparation, and so on. Discuss your goals as well as food/ diet methodologies like quality-based systems (Whole30, Paleo, Primal, Gluten-Free, Keto, Atkins, etc) vs quantity-based systems (“macros”, caloric deficit, Zone, etc). Initial session with follow-up appointments every 4 weeks or as needed. Still not sure or just want to check us out? We offer a free Community Class for all friends in our neighborhood. Our Community Classes are open to members, non-members, experienced, non-experienced CrossFit athletes. Depending on your fitness level it can also be ‘just sweaty’ or ‘super tough’. We’ll guide you through regardless. The workouts are definitely approachable and relatively non-technical, but most importantly, fun! Try a free class! This is open to everyone interested in finding out more about our membership programs. Experience a sample class before joining us! Please look at our calendar for one of our free Community CrossFit classes. We schedule them a few weeks before we begin our on-ramp Foundations Course. We’ll introduce you to our methodology, our community, and our CrossFit program. We will keep the workouts approachable and relatively non-technical, but most importantly fun! These classes are for experienced & non-experienced CrossFit Athletes. It is a great way to check out our gym, our coaches, and our community! I’ve been CrossFitting elsewhere”, etc… Do I still have to do an orientation/ movement checklist? 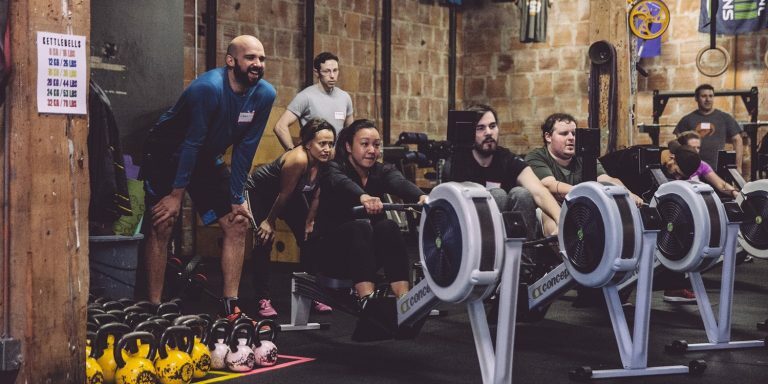 How do I prepare for the Community CrossFit class/ Foundations Course? Make sure you are hydrated. Most people today are chronically dehydrated. We believe that sedentary people need to be drinking 64 ounces daily at minimum! Also we want everyone to have eaten well sometime prior to working out. You can’t drive a Mercedes Benz to it’s potential on an empty tank. What do I need to bring to the Community CrossFit Class/ Foundations Course?